It’s a Korean tradition to eat this soup made with white oval rice cake to welcome a bright, prosperous new year. Also, it’s a classic comfort food any time of year, especially in cold months! 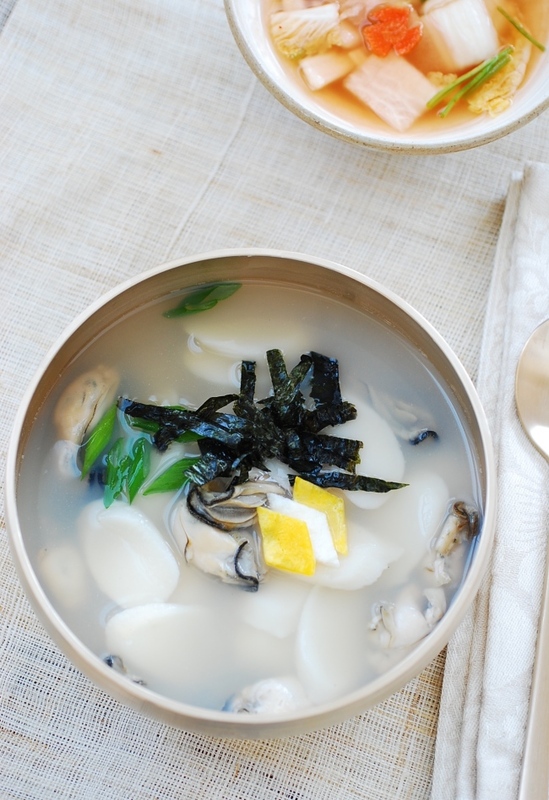 Tteokguk is usually made with beef broth, but try it with oysters for a change. The intense briny flavor of the oysters plays off quite well with the soft, starchy rice cakes. For soups, small oysters work better because chopped up oysters don’t look as appetizing as small intact oysters. Oysters are packed with essential vitamins, protein iron, omega 3 fatty acids, calcium, zinc, etc. Highly nutritional if you’re thinking of healthy eating for the new year! If you like a lighter soup, parboil the rice cake slices separately in boiling water until soft before adding to the broth. It’s a good way to keep the soup from becoming too thick and starchy, if you prefer a lighter soup. Add 6 cups of water and the optional dried kelp to a medium size pot. Bring it to a boil, and continue to boil for five minutes. To make the optional egg garnish (jidan), separate the egg. Lightly beat the white by gently cutting it with a spoon. Stir the yolk with a spoon until smooth. Heat a lightly oiled nonstick skillet over medium low heat. Pour each egg part into a thin layer, tilting the skillet and/or spreading with a spoon. Cook each side briefly until no visible liquid remains. Slice into small diamond shape pieces or short thin strips. Drop the oysters in. Cook for a couple of minutes after the soup comes to a boil again. Season with salt and pepper to taste. Remove the scum. Ladle the steaming soup into individual bowls and top with the scallion and the optional egg and laver strips.